The Walt Disney Co. wants Bart Simpson, the "X-Men" and the National Geographic Channel, and on Thursday confirmed that it will pay $52.4 billion to buy them and other big-name brands and programming from Rupert Murdoch's 21st Century Fox. Disney is hoping to own as much entertainment and sports as it can, and then deliver it on television channels, in movie theaters and, most important, on its direct-to-consumer streaming video system. Consumers are watching less live television and more programming through the internet. Disney is trying to make sure that it can compete with online giants such as Netflix, which is spending billions producing its own programs and already streaming it to over 100 million homes around the world. On Thursday morning, Disney Chairman Bob Iger explained on a call with investors that while Disney would continue to play a big part in the global pay-TV business, it wanted to create a direct-to-home streaming business so that Disney could "flip a switch" to online video, should conditions change. 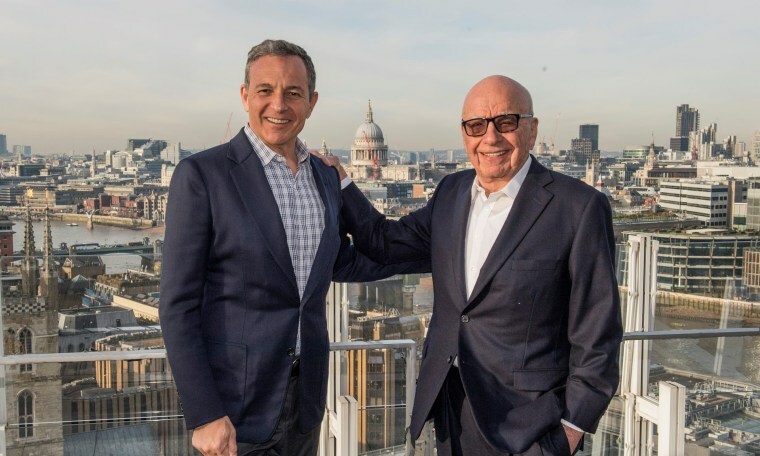 Buying Fox "will allow us to greatly accelerate our direct-to-consumer strategy," Iger said, adding that creating such a business is "our highest priority." The deal follows a host of other merger proposals in recent months with similar goals, including AT&T’s pending acquisition of Time Warner, and Discovery Communications’ acquisition of Scripps Networks Interactive, owner of the Food Network. T-Mobile announced Wednesday that it is buying a cable operator, Level3TV, and aims to launch a TV service next year. Disney's move will force other players, including CBS, Viacom and AMC Networks, to decide whether they need to expand, too. Jonathan Miller, a former chief digital officer at the News Corporation, which like Fox is shares the Murdoch family as a major shareholder, said he sees more consolidation to come among the remaining media companies. Because of the Disney deal, Iger will remain at the company until 2021. Several reports in advance of the deal had suggested there were discussions about a senior position for 21st Century Fox chief executive James Murdoch at Disney. There was no mention of it in the statement on Thursday, though the prospect of a Murdoch at Disney has led to industry-wide head-scratching about how that might work in practice, since 21st Century Fox will continue to compete with Disney. When asked on the investor call about James Murdoch's future, Iger responded: "James and I have had a lot of conversations; he will be integral to the integration." He added, "We will continue to discuss whether there is a role for him or not." Fox is keeping its broadcast network, TV stations, Fox News networks and Fox Sports 1. Disney owns ABC and ESPN. In Fox's call with investors on Thursday, Rupert Murdoch, executive chairman of 21st Century Fox, told analysts that despite selling an estimated two-thirds of the company, the company was not retreating. "Absolutely not," he said. "We are pivoting at a pivotal moment." “With today’s announcement we launch the next great leg of our journey," Murdoch said. "The world of media has obviously been undergoing rapid change. New technologies, competitors and shifting consumer preferences have redrawn the whole media map." The Disney-Fox combination is expected to strengthen Disney’s hand in sports, since it will take charge of Fox’s regional sports networks, according to a statement Disney released Thursday. Disney will have more muscle to negotiate new deals with sports leagues, which have increasingly been trying to distribute games via the internet. Disney is also taking over Fox’s movie and TV studios, combining Fox’s Marvel franchises, like “X-Men,” with Disney's own Marvel-branded movies. Disney will also take over the National Geographic Channel and the entertainment service FX, along with international cable networks. The merger of the two movie studios will give Disney unrivaled clout with theater owners and more leverage to negotiate for a higher percentage of box office revenue. Disney will gain even more leverage in negotiating for higher rates with distributors, such as cable operators, given the breadth of its holdings. ESPN is already the most expensive network carried by any distributor. Disney will also pick up a controlling stake in several distribution entities, including Hulu, the premium online video company, in which Fox and Disney each own 30 percent stakes. (Comcast, which owns NBCUniversal, the parent company of NBC News, is also an owner.) The British satellite pay-TV company Sky and India’s broadcaster Star are also part of the deal. The plans are not without some risk. The Justice Department has already blocked AT&T’s acquisition of Time Warner, citing how much power a combined company would have to hurt competitors. Michael Nathanson, an analyst at the independent research firm MoffettNathanson, said in an investor note on Dec. 11 that there could be regulatory hurdles to overcome. The deal will likely to lead to layoffs. The press statement suggested the combination would result in more than $2 billion of "synergies" — usually a code word for reducing costs — by 2021.